I recently received this wonderful gift in the mail…. 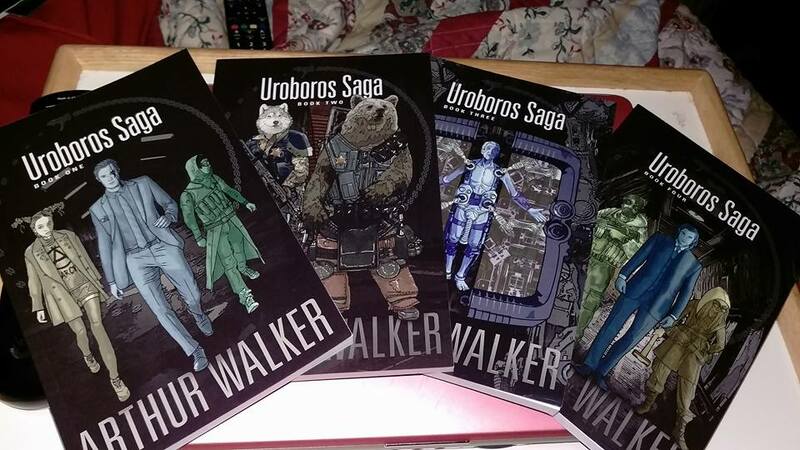 author Arthur Walker was kind enough to send me print copies of his awesome saga books 1-4. THANK YOU Arthur !! I will forever treasure them. They look great on bookcase. I finished book 2 the other day. Wow. Another great read. This Saga is turning out to be a hell of a read. In book 2 we find Silverstein, Taylor, and Ezra trying to overcome the Shutdown. In Finland they meet new allies, Eamon (an officer, and a bear), Abbey (also an officer, and a husky). They also meet a family, A sister, and her two brothers, Tullia, Dragos and Truman. Who happened to meet up with Matthias. Now the 7 of them are out to figure things out and make it right. We see a peek into Matthias’ past, as we do with Ezra’s. We see what makes them tick, what they have been through and the people they have become. We find out some people are not whom they seem. People we use to know and trust, are different and hard to trust. We head back home to Port Montaigne. Running across more clones of Silverstein / Urboros. Not sure if they are good or bad! I know I don’t trust em. The gang is after an object, will they find it? Will they be able to get it? Is a once ally now a threat ?????? We must continue reading to find out !! A MUST READ SERIES ! !